The SKS is a fairly renowned and loved rifle and its origins date back to 1943. The SKS has been through many wars and conflicts and is still used today. The rifle is quite popular among huntsmen and precision shooters because of its exceptional reliability and inexpensive ammo. Here, we’ll be talking about the scope mounts suitable for an SKS. With so much tech on the market, even an old school rifle like the SKS can be made exceptionally accurate. We’ll take a look at the qualities of a good SKS scope mount and the advantages of upgrading it. We will also review some of the best SKS scope mounts on the market to help you with your buying decision. A SKS scope mount, like any other weapon, must inevitably have some specific qualities to perform efficiently. For the sake of simplicity, let's outline and discuss these factors one by one. The SKS fires 7.62.39mm round which makes it suitable for hunting small and big game. This conclusively means that rifle is very often to be carried for long distances during hunting trips. Hence you must look out for mounts which are lightweight, reduce fatigue, and also improve accuracy. Additionally, the loading mechanism of the SKS demands a scope mount that should not meddle with the bolt and ejector port. Since the SKS shoots a heavy caliber and is widely used for hunting, the scope mount must be durable enough to withstand recoil and jerks. Furthermore, a scope mount should stay properly aligned with your rifle at all times. It helps in easily sighting in the rifle and zeroing in the scope, thus improving the accuracy of the rifle. Most scope mounts feature a Picatinny or weaver type design, which is the standard these days. Weaver style mounts offer a low profile design, whereas the Picatinny type mounts are more versatile for attachments. Apart from that, many SKS scope mounts feature a see-through design which allows the shooter to use iron sights without removing the scope. Another important factor to consider is the fitting of the scope with your rifle. A good scope mount must fit snug with your SKS so you must not falter while taking shots. Are All SKS Scope Mounts the Same? Some scope mounts might require taping and drilling of the receiver, whereas some can simply be mounted using side screws. The ease of an installation is a primary difference among different types of scopes. 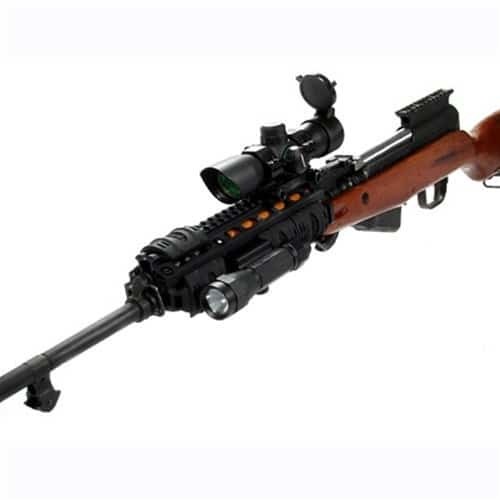 A good scope must not require any modifications to your SKS for installation or operation. However, modifications sometimes become necessary, such as when using ATI/TAPCO scopes. SKS scope mounts offer weaver or picatinny rails to help attach scopes easily. 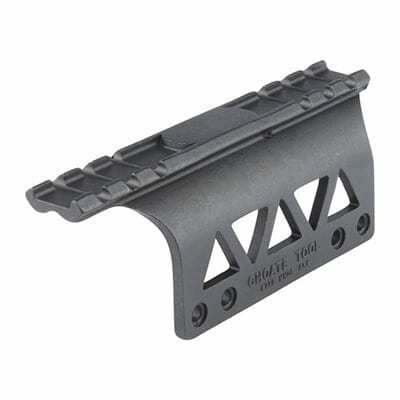 The mounts featuring these rails offer versatility to attach more accessories to the rifle. Additionally, the scope mount must not be so long that it blocks the ejection port, which is also the loading point in an SKS. Other options such as side mount also help in attaching more accessories to the rifle. Note: You must ensure that the dimensions of the scope mount you are buying will be compatible with your SKS model. 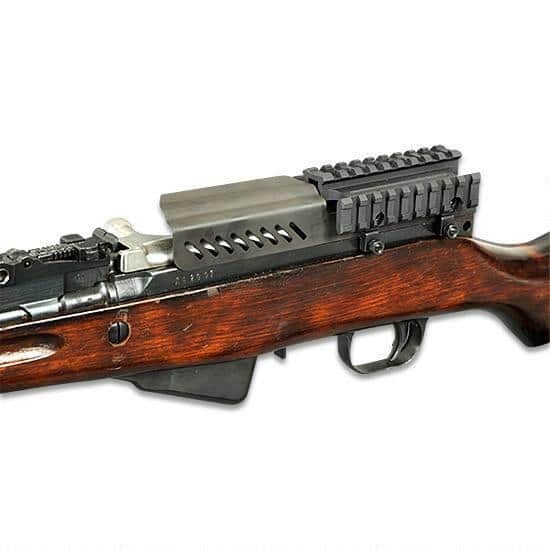 For example, the Chinese ‘Type 56’ model of the SKS requires a specific type of scope mount due to its rare and uncommon structure. Upgrading the scope mount of your SKS opens a new area of customization options. If your SKS does not have a scope, getting a scope mount is necessary to gain precision and improve the efficiency of your rifle. The SKS OEM scope mount is a PU type one-sided scope mount, like the ones originally used with the Mosin Nagant during WWII. Upgrading the scope mount assures that you can add more accessories to the SKS. Options such as rails and side mount allow you to add accessories like lasers and flashlights to the scope. Another reasonable factor for adding the scope mount is the added safety. Some SKS scope mounts feature a deflector which prevents the spent off cartridges from hitting your face while shooting. It is a problem especially faced by left-handed shooters and the SKS. Adding a good scope mount to your SKS provides you with a sturdy platform for your scope. AD mounts allow you to install or remove the scope quickly for cleaning, or under rough conditions. A scope mount lets you adjust the height and the eye relief of your scope so you can get to a proper and comfortable position for shooting. 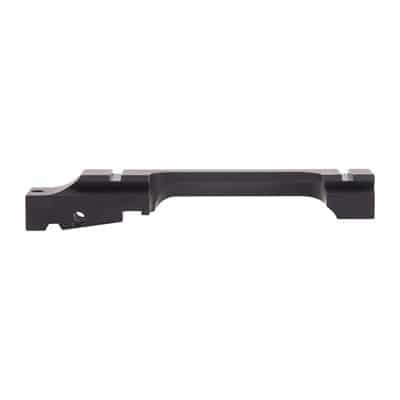 Good SKS scope mounts help with instant and accurate zeroing-in of your scope. Models that have a see-through design help you in using iron sights while the scope is mounted. This feature also comes in handy if your scope breaks or your batteries dry out. 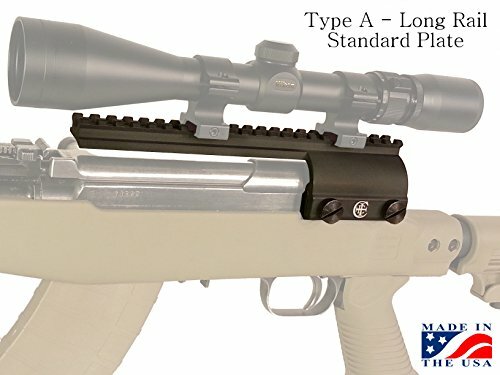 As already mentioned, about what makes a scope mount unique and reliable, different scope mounts differ in qualities and capabilities and have their own unique features. The UTG pro is a drop-in receiver cover type scope mount which fits snug and provides a tight fit with your SKS. The mount has a shell deflector design which protects the shooter and the scope from spent cartridges. The UTG pro has been cast and precision machined from stainless steel and features a hard coat anodized coating making it resistant to wear and tear. This model delivers plenty of eye relief. The 22 slot Picatinny rail allows you to install long scopes as well as other accessories. This model has a see-through design and weighs only 12.2 oz. It offers simple installation with Repeatable 4-Point Rock Solid Locking onto the Receiver. The UTG pro scope mount has a long 22 slot Picatinny rail which allows you to use additions such as a flashlight and thermal cameras. The mount is sturdy and the shell deflector is a nice feature. Mounting it is easy, and it fits snug. The stainless steel machined base provides shockproof stability. Overall, this is a good scope mount to buy. The S&K scope mount is a flat weaver style mount which can be bolted down to the receiver. The mount is easy to install and you probably won’t need a gunsmith to get it installed. The mount has a low profile, meaning your scope will sit close to your rifle. The scope has a simple design and is strong enough to withstand recoils and jerks. The easy to detach design allows you to install the original sights whenever you desire. The S7K insta scope mount is quick and easy-to-install. The simplistic design offers very limited capabilities, but the durability and ruggedness of the mount make it perfect for hunting and long range shooting. The absence of a deflector, however, makes the scope and shooter susceptible to damage. The scope mount is decently priced and won't hurt your pocket. The Choate SKS scope mount features a durable stainless steel body and a flat top picatinny rail. The mount has a raised design so the shooter can use the scope as well as iron sights all at once. 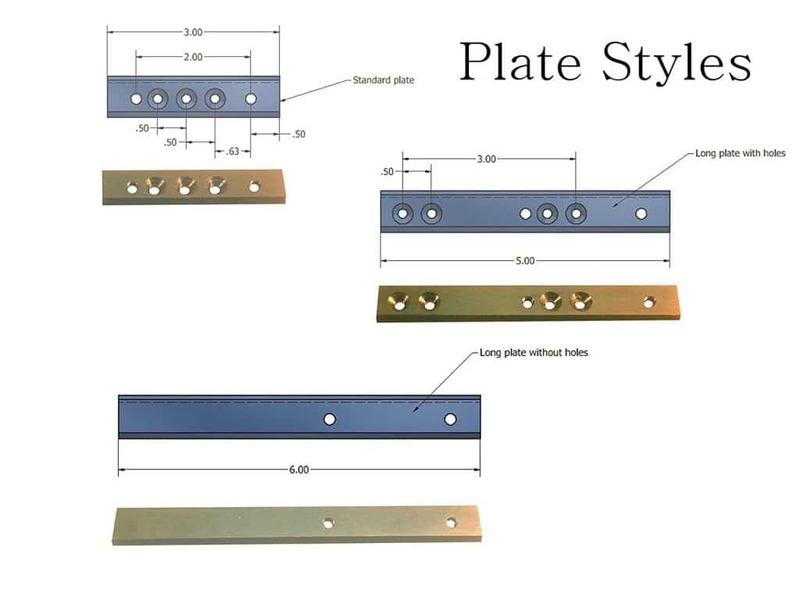 It is a one-sided mount and requires four 8-40 screws to install. The mount requires the receiver of your SKS to be taped and drilled which, eventually is a tedious and irreversible job. The mount is quite sturdy and fits perfectly well with the SKS, preventing any wobbling while using the scope and improving accuracy. The Choate SKS scope mount is a solid piece of steel which has to be tapped and drilled into the receiver. The mount is sturdy and retails zero, but offers limited space. This mount is an overall good and durable choice, especially if you don’t want a fancy or flimsy one for your SKS. The price is really affordable as compared to its counterparts. The gunsmithing, however, might feel a bit emotional and tedious. But the outcome is surely perfect. These scope mounts have been machined from aluminum and feature a low profile design with picatinny rail top. The mount attaches to the rifle using a side plate. 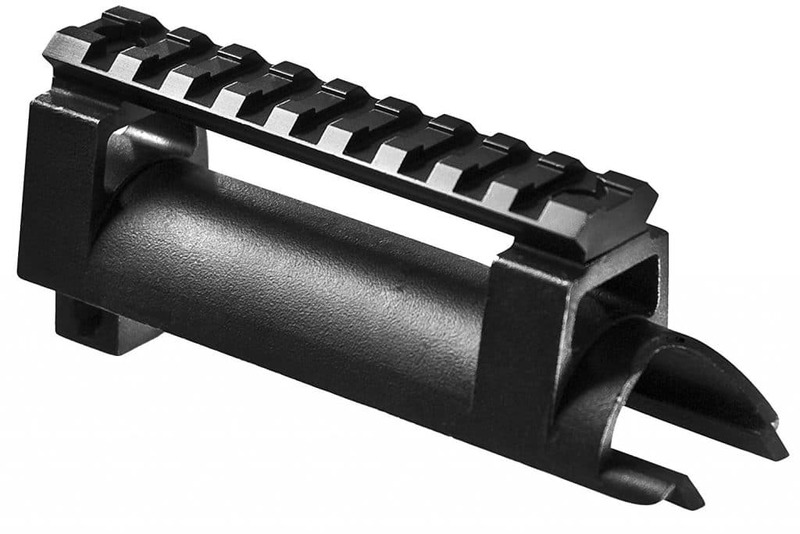 The mount is available in short and long rail variants. It also allows the shooter to use stripper clips for loading, whereas the longer version acts as a deflector on the ejection port. The hardcoat anodized design makes it resistant to harsh weather conditions. The optics can be quickly attached and detached, meanwhile retaining their original zero position. The scope mount delivers a sturdy platform for mounting scopes and shooting accurately. The crazy Ivan scope mount uses side plates with screws for installation on the receiver. The long and short versions are suitable for respective feature loving shooters. The mount requires gunsmithing for installation, which might be a con depending upon your skills. The scope mount is lightweight and is good for hunting and long-range shooting. The Barska scope mount can be attached to the SKS by removing the rear receiver cover and replacing it. The top features a Picatinny/weaver rail which allows quick and easy mounting of the scope. Other accessories like flashlights and lasers can easily be attached too. The mount is only three and a half inches long and weighs a few ounces. 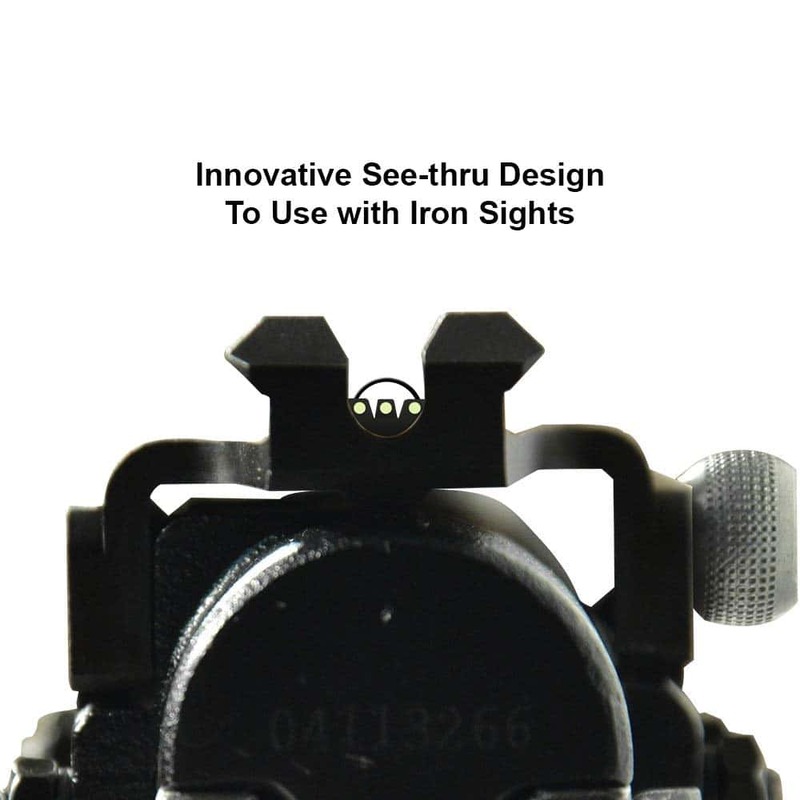 The lifted design of the mount allows you to use iron sights without removing it. The Barska scope mount is quite inexpensive and delivers plenty of eye relief for the shooter. The Barska SKS mount is a compact and lightweight scope mount for your SKS rifle. The mount is pretty inexpensive, and the one-year limited warranty from the manufacturer covers you from any damage. The mount requires gunsmithing to be installed, and you must hand it over to an experienced gunsmith since some finishing might be required. The SKS is the rifle preferred among hunters and marksmen. Using a scope mount greatly improves its accuracy and allows the user to install several other accessories. A good SKS mount must be durable, lightweight, easy-to-install, must retain zero, and should fit snug with the rifle. The type of scope you must use with your SKS greatly depends upon your individual preference and use.